This (NSFW due to lyrics?) 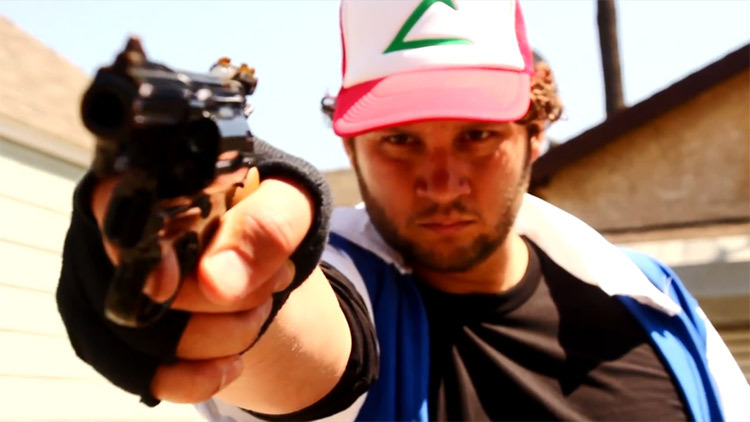 video does a decent job interpreting Pokemon meets underground fighting. Just look at everyone fighting for the top 1 million pokedollars. I had to laugh when Team Rocket said they were there for Pikachu and Ash said, "He's mine." I guess Ash is just as blind as Brock. James knows how to hold his gun gangster style while Ash really doesn't care. I'll give big props to Misty for "I catch them all like disease on a pornstar" and for Brock keeping his eyes closed and "Ladies pretty, I go dumb." Who else thinks the plot is actually really plausible in the world of Saints Row meets Pokemon?